In July 1968 ethologist John B. Calhoun built a paradise for mice. Mother Goose rhymes can be hidden phonetically in French and German. David Davis, Showdown at Shepherd’s Bush, 2012. Timothy D. Noakes, “Reduced Peripheral Resistance and Other Factors in Marathon Collapse,” Sports Medicine 37:4–5 (April 2007) 382–385. Jonathan Esteve-Lanao, Alejandro Lucia, Jos J. deKoning, and Carl Foster, “How Do Humans Control Physiological Strain During Strenuous Endurance Exercise?” PLoS One 3:8 (August 2008), e2943. Tim Lincoln, “Mostly in the Mind,” Nature 389:6654 (Oct. 30, 1997), 911-912. Karl Lennartz, “Some Case Studies on How Media Constructs Olympic Legends,” Timisoara Physical Education and Rehabilitation Journal 2:3 (2009), 10-19. 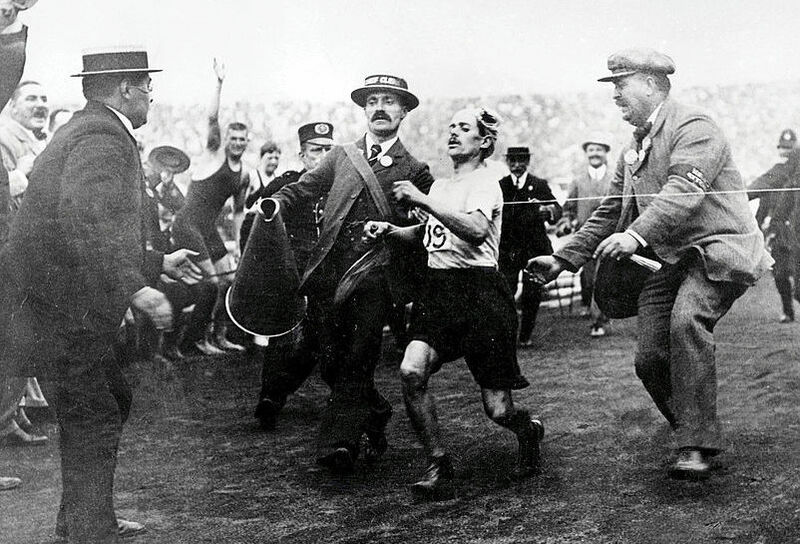 Markus Stauff, “The Pregnant-Moment Photograph: The 1908 London Marathon and the Cross-Media, Evaluation of Sport Performances,” Historical Social Research / Historische Sozialforschung 43:2 (2018), 203-219. Peter Lovesey, “Conan Doyle and the Olympics,” Journal of Olympic History 10:10 (2001), 8. Mark Will-Weber, “Dorando Pietri,” Runner’s World 34:1 (January 1999), 42-43.
International Olympic Committee, “Dorando Pietri” (accessed Jan. 27, 2019). “Dorando Pietri,” Arthur Conan Doyle Encyclopedia (accessed Jan. 27, 2019). Encyclopaedia Britannica, “Dorando Pietri: Falling at the Finish” (accessed Jan. 27, 2019). Simon Kuper, “The Original Olympic Hero,” FT.com, July 27, 2012. “Marathon Men Were Games’ Attraction,” [Los Angeles] Daily News, July 22, 2012, C.1. “Italian Stumbles to Marathon Glory,” Sunday Times, May 27, 2012, 15. Ian O’Riordan, “London Calls Me to Retrace Pietri’s Footsteps,” Irish Times, April 21, 2012, 12. Simon Burnton, “How Dorando Pietri Lost the Race but Won the Hearts of Millions,” Guardian, Feb. 29, 2012. Stuart Bathgate, “Centenary of Albert Hall Marathon, Where Pietri Fell Short Once Again,” Scotsman, Dec. 18, 2009, 56. David Davis, “Beijing 2008,” Los Angeles Times, July 24, 2008, D.1. Elliott Denman, “Remembering the Incredible 1908 Marathon,” New York Times, July 23, 2008. Doug Gillon, “Going the Distance: A Centenary Tale Full of Drama and Heroism,” [Glasgow] Herald, April 12, 2008, 14. Richard Owen, “Italy Celebrates Centenary of a Fallen Hero,” Times, Feb. 18, 2008, 33. “Dorando Pietri: London Marathon,” Times, March 29, 1995, 1. Charles Singer, “The First Case of Marathon Fever,” New York Times, Oct. 9, 1983. Bud Greenspan, “Truths, Half-Truths and Myths of Marathon Running,” New York Times, Oct. 26, 1980. Dave Anderson, “The Olympic Time Capsule,” New York Times, April 25, 1976. “Dorando Certainly Won,” Montreal Gazette, Jan. 23, 1909, 7. “Fifteen Teams in Race,” New York Times, Dec. 4, 1908. “Why Is Dorando Not Dorando? Because He Is Pietri,” The Sketch 63:809 (July 29, 1908), 69. Wikipedia, “Baader–Meinhof Effect” (accessed Jan. 31, 2019). “There’s a Name for That: The Baader-Meinhof Phenomenon,” Pacific Standard, July 22, 2013. Arnold M. Zwicky, “Why Are We So Illuded?”, Stanford University, September 2006. Wikipedia, “Confirmation Bias” (accessed Feb. 2, 2019). Wikipedia, “Red Army Faction” (accessed Jan. 31, 2019). Wikipedia, “Great Mull Air Mystery” (accessed Jan. 31, 2019). Wikipedia, “Mull” (accessed Feb. 4, 2019). “The Riddle of the Lost Flight,” Independent, Feb. 18, 2004. “Mystery Plane Found on Sea Bed,” BBC News, Feb. 7, 2004. “Sunken Wreckage Identified as Crashed Wartime Flying Boat,” Scotsman, April 3, 2004. “The Great Mull Air Mystery,” BBC Radio 4, Aug. 22, 2015. This week’s lateral thinking puzzle was contributed by listener Peter Bartholomew. 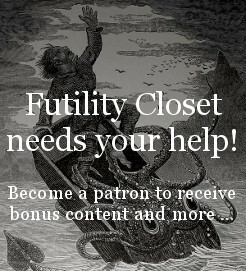 Please consider becoming a patron of Futility Closet — you can choose the amount you want to pledge, and we’ve set up some rewards to help thank you for your support. You can also make a one-time donation on the Support Us page of the Futility Closet website. Many thanks to Doug Ross for the music in this episode.